Burma’s government in a move to speed up trade and tourism between Thailand, announced yesterday, August 28, that it would allow foreigners holding its visa’s to travel into the country by any of the four entry points. 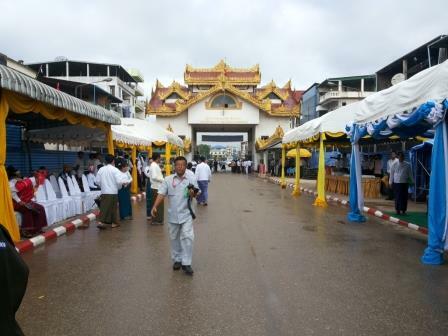 The four border gates are between Myawaddy-Mae Sot, Tachileik-Mae Sai, Kawthaung-Ranong and Htee Khee-Sunaron. Speaking at the ceremony held to mark the opening of the new crossing points, the Minister of Immigration and Population, U Khin Ye, said that the border gates would not only benefit trade but would also build friendship between the two countries. Saw Lah Lel, the manager of the newly opened, Moe Ko San Travel and Tour Company Limited and Trading Company Limited, owned by KNLA 7th brigade, told Karen News that he was optimistic that by allowing travel between the two countries that it will boost tourism and hotel occupancy rates. The opening ceremony was attended by Member of Parliament, U Khin Ye – Immigration Minister, the Karen State border officer for security, Colonel Aung Lwin, Member of Parliament, U Htay Aung from the Ministry of Hotels and Tourism, Padoh Saw Ah Toe from the Karen National Union and Major Saw Zero, the Myawaddy liaison officer. Thai officials attending the ceremony included the Governor of Tak Province, the chairman of the Tak Province Trading Group and Thai military officers. Karen News is led to understand that tourists who want to cross the border through Thailand to Burma are permitted to stay for 28 days. Government officials indicated to Karen News that border gates between China and Burma are also being planned, but a failure to reach a ceasefire agreement with Kachin and ongoing armed conflict in northern Shan State have stalled the plans.